For the copious materials which the friends of Sir Walter have placed at my disposal, I feel just gratitude. Several of them are named in the course of the present volume; but I must take this opportunity of expressing my sense of the deep obligations under which I have been laid by the frank communications, in particular, of William Clerk, Esq., of Eldin, John Irving, Esq., W.S., Sir Adam Ferguson, James Skene, Esq., of Rubislaw, Patrick Murray, Esq., of Simprim, J. B. S. Morritt, Esq., of Rokeby, William Wordsworth, Esq., Robert Southey, Esq., Poet Laureate, Samuel Rogers, Esq., William Stewart Rose, Esq., Sir Alexander Wood, the Right Hon. the Lord Chief Commissioner Adam, the Right Hon. Sir William Rae, Bart., the late Right Hon. Sir William Knighton, Bart., the Right Hon. J. W. Croker, Lord Jeffrey, Sir Henry Halford, Bart., G. C. H., the late Major-General Sir John Malcolm, G. C. B., Sir Francis Chantrey, R. A., Sir David Wilkie, R. A., Thomas Thomson, Esq., P. C. S., Charles Kirkpatrick Sharpe, Esq William Scott, of Raeburn, Esq., John Scott, of Gala, Esq., Alexander Pringle, of Whytbank, Esq., M.P., John Swinton, of Inverleith-place, Esq., John Richardson, Esq., of Fludyer Street, John Murray, Esq., of Albemarle Street, Robert Bruce, Esq., Sheriff of Argyle, Robert Ferguson, Esq., M.D., G. P. R. James, Esq., William Laidlaw, Esq., Robert Cadell, Esq., John Elliot Shortreed, Esq., Allan Cunningham, Esq., Claud Russell, Esq., James Clark son, Esq., of Melrose, the late James Bailantyne, Esq., Joseph Train, Esq., Adolphus Ross, Esq., M. D., William Allan, Esq., R. A., Charles Dumergue, Esq., Stephen Nicholson Barber, Esq., James Slade, Esq., Mrs Joanna Baillie, Mrs George Ellis, Mrs Thomas Scott, Mrs Charles Carpenter, Miss Russell of Ashestiel, Mrs Sarah Nicholson, Mrs Duncan, Mertoun-Manse, the Right lion, the JLady Polwarth, and her sons, Henry, Master of Polwarth, the Hon. and Rev. William, and the Hon. 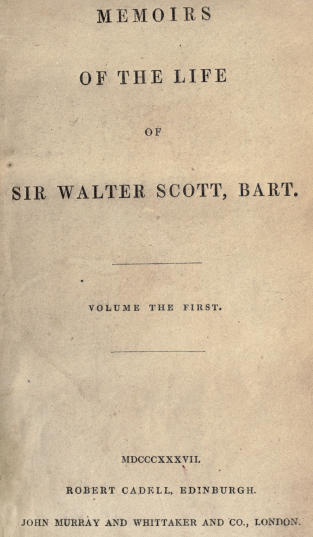 Francis Scott. I beg leave to acknowledge with equal thankfulness the courtesy of the Rev. Dr Harwood, Thomas White, Esq., Mrs Thomson, and the Rev. Richard Garnett, all of Lichfield, and the Rev. Thomas Henry White, of Glasgow, in forwarding to me Sir Walter Scott's early letters to Miss Seward: that of the Lord Seaford, in intrusting me with those addressed to his late cousin, George Ellis, Esq. : and the kind readiness with which whatever papers in their possession could be serviceable to my undertaking were supplied by the Duke and Duchess of Buccleuch, and the Lord Montagu; the Countess-Duchess of Sutherland, and the Lord Francis Egerton; the Lord Viscount Sidmouth, the Lord Bishop of Llandaff, the Right Hon. Sir Robert Peel, Bart., the Lady Louisa Stuart, the Hon. Mrs Warrender, and the Hon. Catharine Arden, Lady Davy, Miss Edgeworth, Mrs Maclean Clephane, of Torloisk, Mrs Hughes, of Uffington, Mrs Charles Richardson, Mrs Bartley; Sir George Mackenzie of Coul, Bart., the late Sir Francis Freeling, Bart., Captain Sir Hugh Pigott, R.N., the late Sir William Gell, Sir Cuthbert Sharp, the Very Rev. Principal Baird, the Rev. William Steven, of Rotterdam, the late Rev. James Mitchell, of Wooler, Robert William Hay, Esq., lately Under Secretary of State for the Colonial Department, John Borthwick, of Crookstone, Esq., John Cay, Esq., Sheriff of Linlithgow, Captain Basil Hall, R.N., Thomas Crofton Croker, Esq., Henry Cheney, Esq., Alexander Young, Esq., of Harburn A. Valpy, Esq., James Maidment, Esq., Advocate, late Donald Gregory, Esq., Robert Johnston, Esq., Edinburgh, J. J. Masquerier, Esq., of Brighton, Owen Rees, Esq., of Paternoster Row, William Miller, Esq., formerly of Albemarle Street, David Laing, Esq., of Edinburgh, and John Smith the Youngest, Esq., of Glasgow.